This stand up paddle board is best for touring. The Endurance is the ultimate touring SUP board built for overnight multi-day camping adventures. 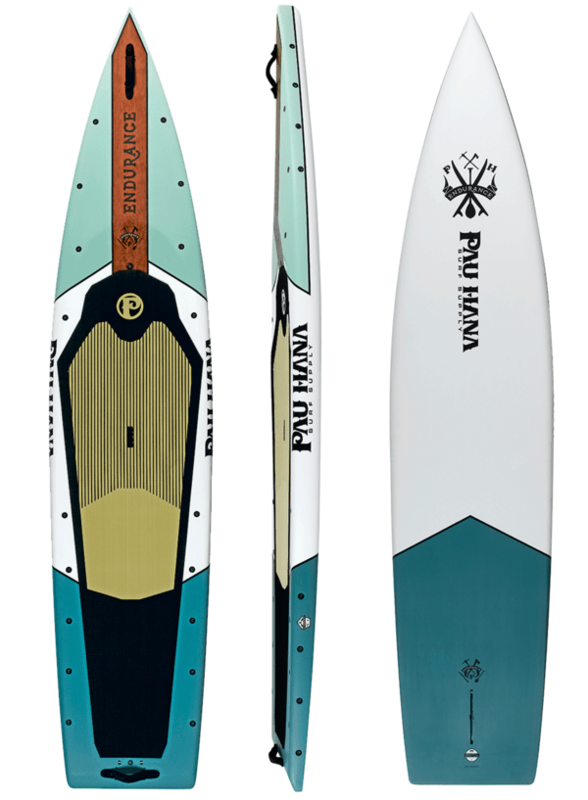 The Pau Hana 12’0” Endurance is the ultimate touring SUP. It’s the best paddle board for overnight camping trips and weekend adventures. The hull is reinforced and protected with Ricochet™ (Pau Hana’s proprietary technology), so that it can bounce off rocks and take a the beatings other boards can’t. It was also designed to carry all the gear you need for long adventures on water trails, along coast lines, and archipelagos. Ricochet™ hull protection that can withstand up to 1000psi. The Endurace has 35 SeaMount® anchor points to bolt down gear and keep it in place. Our gorilla nets are strong and hold stuff down securely. If you wipe out and get worked over in a rogue wave, rapid, or current, your gear won’t fly off or slip away. The shape was patterned off our fastest racing board so it paddles efficiently and it’s beefed up in the tail to accommodate heavy loads. The soft grab handles on the nose and tail make it easy to pull into or out of the water. The full length recessed deck and pad we’re designed to sleep on so that you can be level and insulated. It was designed by Todd Caranto, a pioneer of the SUP industry who’s been making paddle boards since 2007. The Pau Hana Endurance is the ultimate rugged touring board built for off the grid adventures.